At Walgreen’s this afternoon, I overheard the young man behind the counter tell another worker that he is a big Giants’ fan but his favorite baseball player is Albert Pujols. I get that, so I spoke up. Regular readers may recall in the November 4 blog post I confessed to committing post-season treason, having come under the spell of the feisty, freaky Giants after moving here. And yet after a 50-year relationship with the Cardinals, I have some tender feelings for them as well. I told the young man at Walgreen's that a week ago, I bought a ticket on StubHub to the Giants’ home opener, on April 8, against the Cardinals. Okay, I paid about what I used to pay for a winter coat at Marshall’s when I was working full time, but I paid because I really wanted to be at that game. I just couldn't imagine enjoying it on television when all the excitement was taking place only four miles away. Yesterday morning, the forecast called for 56 degrees and 15-25 mph winds. The ballpark sits in a cove, right on the water. I put on the following: A black cami, a long-sleeved black t-shirt, a long-sleeved black sweatshirt, my Tim Lincecum t-shirt, my whale-watching long johns, fleece-lined wind-proof leggings, black wool sock liners, fuzzy orange socks, one baseball earring and one Cardinal earring. I topped it all off with a fleece jacket and packed a wool scarf, wool gloves, a fleece headband and a wool hat. That, dear Cardinals fans, is what it takes to feel comfortable at a ballgame in San Francisco. I felt great – even when I discovered I was in the very last row. Before I made the climb, I thought it might be like dangling from the blimp, but it was just fine. Nice people were on either side of me, no one was in front of me (just the long stairs leading down) and I was directly above home plate. I could see the entire park, the party boats in the cove and seafaring container ships entering and leaving, guided by tugs. I teared up when the Cards took the field. 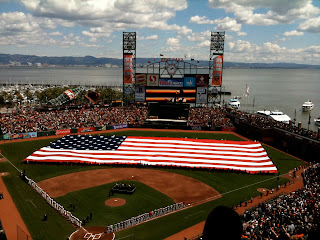 I teared up when the Giants took the field. I loved it all, right up until the 11th inning, when Tony wouldn't let the Cards pitch to any of the Giants and the Giants’ pitchers (and we saw a lot of them) couldn’t seem to catch a break from the umpire, whose strike zone was all over the place. I know better, but I left the game – and I had a lot of company. On the Muni, we all cheered when a guy on his phone called out that the Giants won in the 12th inning. You might think eight hours of baseball was enough (I left the apartment at 10:30 a.m. and got home at 7 p.m.), but I watched the last inning on the TIVO recording. Of course I didn't tell the young man at Walgreen's all that, but we did talk about some highlights -- and there were many. To encourage him to continue to talk to customers, especially old women who usually are ignored in stores, later today I went back to Walgreen's and gave this same young man the 2011 Giants calendar that I received at the ballpark yesterday. He was thrilled. To backtrack a bit: On that first walk to Walgreen's, I encountered a sidewalk sale. Diane and John were selling books, shelves and some of Diane’s clothing because she recently retired. As it happens, Diane and I have the same taste. She had my favorite brands – Flax, We Be Bop, Blue Fish and a designer I didn’t know but who clearly knows me. There on the corner I removed my fleece jacket and my San Francisco sweatshirt and tried on some of the outfits. No one walking by paid any attention – except the two other short, round women who stopped to try on clothes too. One more magic moment to report on: Wednesday, I went with my friends Nancy and Betty-Lou to dinner at the home of two of their dearest friends. The company, the food and the conversation all were terrific, plus there was a bonus. A redwood tree with six thick trunks grows right alongside the wooden deck in the long, narrow backyard. I learned that in the mid-1940s, someone who lived in the house brought home a tiny redwood sprout in a small cup and planted it, probably expecting nothing. What grew was private redwood forest that towers high over the house. I went out on the deck for a minute to pay homage to the tree -- yet another serendipitous adventure here in my amazing new hometown. Ms. Corrigan, I grew up in St. Louis with the Post Dispatch and remember your columns and writings well. Yours was one of the bylines I looked for every day! What a pleasant surprise to find you recently via a comment on the PD online somewhere. I now live in South Carolina, but a best friend lives up your way in Santa Cruz. I've been lucky enough to visit in the spring. How glorious it is in that part of the country! Looking forward to more of your serendipitous adventures! Pat, I'm passing along your way the Versatile Blogger Award. I received it from a fellow blogger, which is how the award gets around and inspires us to write and connect and write more. 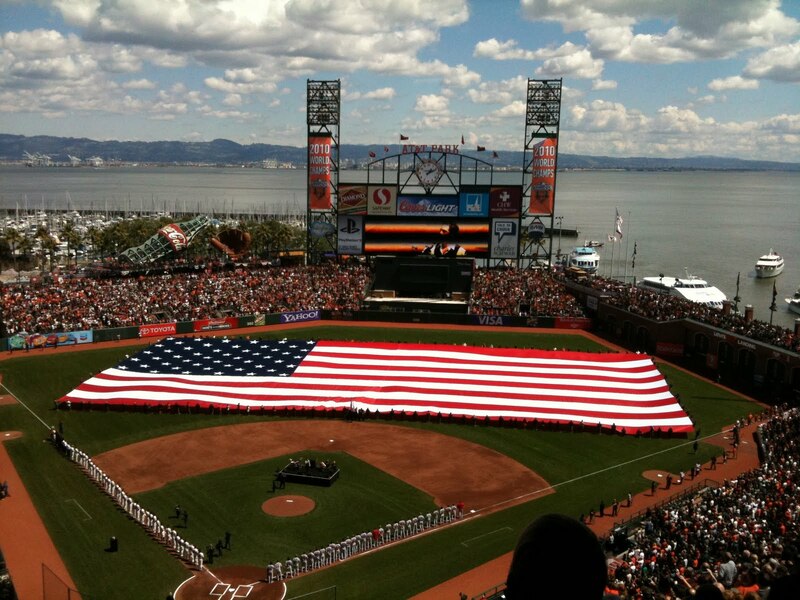 Though we won't be GOing to the ballpark on our visit to SF.